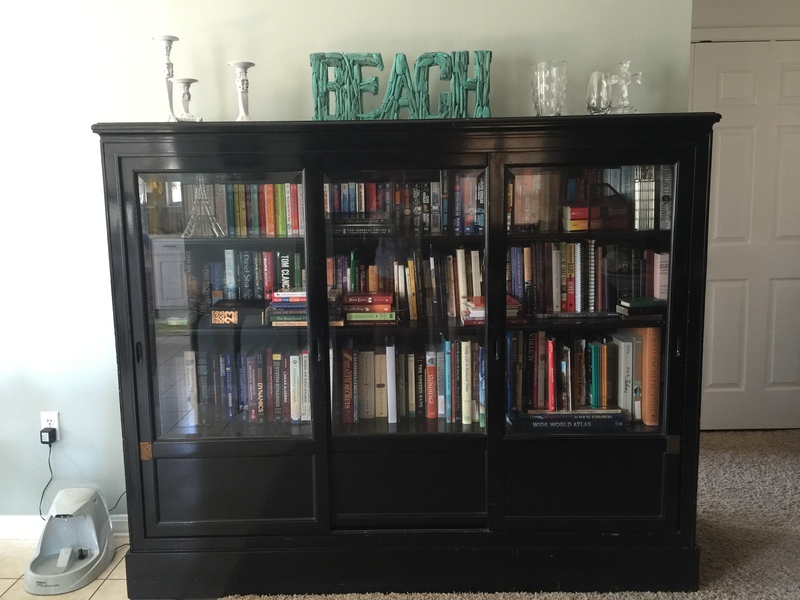 My parents gave us this bookcase because we are book hoarders avid readers and they no longer had need/room for it. We read widely, so the set of books in this bookcase is not representative of our taste. The children’s and adolescent literature collections fill the guest bedrooms on Target bookcases (not our best investment) and Cubeicals (surprising longevity), my professional literature sits on other shelves in the living room,and our classics collection is our bedroom. This bookcase is actually more representative of the need to part with some books, like outdated college texts. Getting there. Slowly. This bookcase has a history. My dad used to work as the managing engineer for a plant owned by a company headquartered in Austria, and he acquired this bookcase when the plant closed its doors and liquidated its assets. It used to sit in his office, so I suppose he was a bit attached to it. The bookcase is solid mahogany, but you wouldn’t know because it was lacquered black to hide its beauty from the pilfering Nazis during the war, according to the story passed down through the company. The bookcase was later brought to the states from the original factory in Austria. On a more fun note, we thought we would like to try using Annie Sloan Chalk Paint for the first time to paint the bookcase (either as the top coat(s) over the encapsulating product or, if no lead hazard exists, just as the paint of choice). We are debating different color choices, and having never used ASCP before, we are having a tough time deciding what to do. A conservative Graphite or Old White? A bold Antibes Green or Emperor’s Silk with clear and dark wax? Or a layering of different colors…or a custom mix of different colors? Oh, the possibilities. The bookcase sits along the long wall we recently painted in our living room between our baby grand piano (also a high gloss black lacquer) and our new dining table. 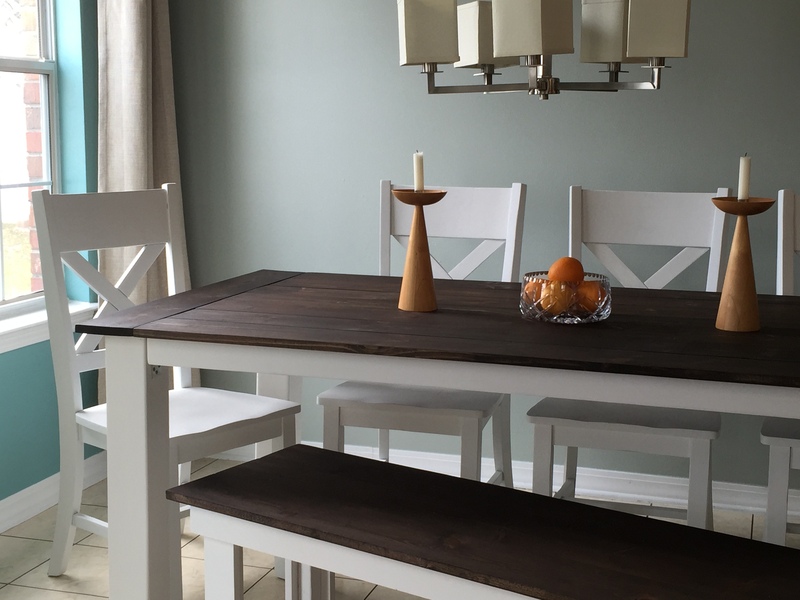 We like having neutral pieces along with fun, bright colors (note the bright paint above! ), so we aren’t sure which direction to go. Normally we would use bright colors on smaller pieces and neutrals on larger pieces, but we don’t want all of our larger painted furniture to end up white (and the lack of a true black in the ASCP collection has given us pause for this guy). Then there’s the possibility of foregoing ASCP and just refreshing its black lacquer to maintain the look it has had for 65+ years (at least). If it isn’t painted with lead paint, we might even consider the tedious process of stripping it down to the wood and restoring its original beauty. If you have any experience with painting furniture, especially with chalk paint, what would you try? What about stripping and restoring pieces? De-lacquering? Lead paint nightmares? Any ideas or tips would be appreciated!